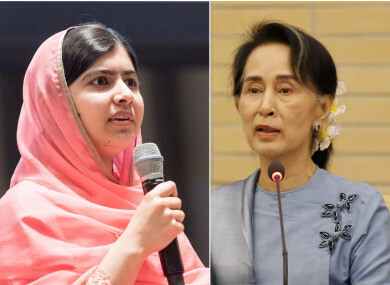 NOBEL PEACE LAUREATE Malala Yousafzai has issued a statement criticising fellow peace prize winner Aung San Suu Kyi for her failure to criticise the violence against Rohingya refugees in Myanmar. Since 25 August, a total of 87,000 mostly Rohingya refugees have arrived in Bangladesh since violence erupted in neighbouring Myanmar. Thousands of the stateless Muslim minority have fled the mainly Buddhist nation and poured over the border since the latest round of fighting broke out. Around 400 people — most of them Rohingya Muslims — have died in violence searing through Myanmar’s northwestern Rakhine state, the army chief’s office said on Friday. Malala, who was shot by the Taliban for advocating education for girls in her native Pakistan, was granted the Nobel Peace prize aged 17 in 2014. In a post on Twitter, she condemned the violence against the Rohingya people in Myanmar and said she has yet to hear fellow Nobel peace laureate Aung San Suu Kyi do likewise. She said: “If their home is not Myanmar, where they have lived for generations, then where is it? Rohingya people should be given citizenship in Myanmar, the country where they were born. Over the last several years, I have repeatedly condemned this tragic and shameful treatment. I am still waiting for my fellow Nobel laureate Aung San Suu Kyi to do the same. The world is waiting and the Rohingya Muslims are waiting. Aung San Suu Kyi won the Nobel Peace Prize in 1991. She has been the face of the pro-democracy movement in Myanmar for decades, but also endured house arrest for much of that time while a military junta ruled the country. She has denied that she is standing by while Rohingya Muslims die in clashes with security forces. Suu Kyi’s government have denied reports of atrocities, refusing visas to UN officials charged with investigating the allegations. They have frequently condemned international media coverage and blocked press access to much the war-torn region. Email “Malala says 'world is waiting' for Aung San Suu Kyi to condemn violence against Rohingya Muslims”. Feedback on “Malala says 'world is waiting' for Aung San Suu Kyi to condemn violence against Rohingya Muslims”.